Offering Commercial Restroom ADA Grab Bars are designed to give assistance to the elderly and handicap users. They are usually mounted on the walls or toilet partition panels. All ADA Grab Bars have an 1-1/2” offset clearance, and will support loads in excess of 900 lbs when properly installed. Fabricated of high quality 18 gauge stainless steel with a #4 brushed satin finish. Available in 1-1/4" or 1-1/2” outside diameter dimensions. All bends are formed by an automatic mandrel bending process. Most garb bars ship in two business days. Grab bars provide additional support when using a restroom. The function of grab bars is to give the restroom user additional support when getting onto and off of a toilet. This bar allows the user to pull, lift or maneuver them self when visiting the restroom. 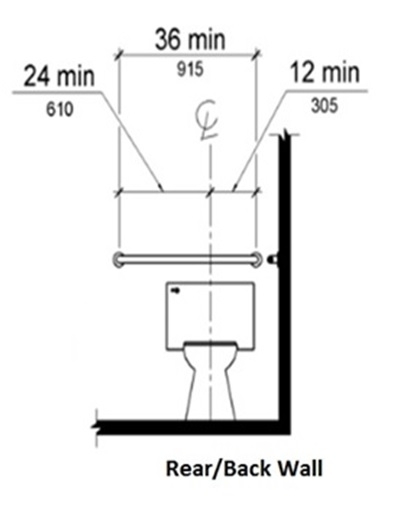 Restroom dimensions vary so there are a number of designs to help meet customers’ needs. The most common design is a straight bar with 2 anchoring contact points. There are also another variant to this design where there is a center post for additional support. Other varieties offer angles for corners, floor mount and wall mount, as well as some that are on a pivot that can swing away when not needed. Grab bar s are utilized in wet, dry, and areas with heavy traffic as they are very durable and versatile. There are a number of options and features available when looking at grab bars. A base line for grab bars is that they are constructed of 18 gauge Stainless Steel in an #4 Satin finish. 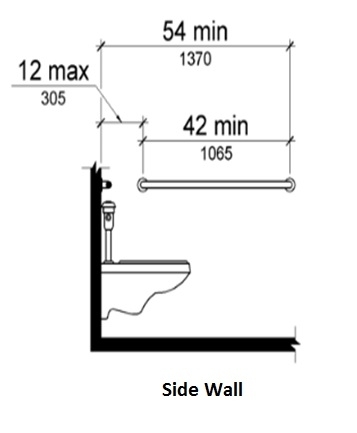 For stalls that need to be in compliance with ADA regulations, a 42” Grab bar for the side wall and a 36” for the back are the minimum sizes allowed. These are also the most commonly used in restrooms but sizes that we offer are 16, 18, 24, 32, 36, 42, 48 and 52. Concealed Snap Flanges are the most common installation for grab bars as this hided the hardware when installing. We offer three mounting options: Concealed Snap Flange, Set Screw Concealed Flange and Exposed Mounting. Other options include diameter size and a textured finish. Diameter sizes offered are 1.5” (most common) and 1.25” (less common). A textured finish (Peened) is often used in wet areas so there is additional grip for safety and smooth (Non-Peened) are often used in most restroom applications. To help with ADA Regulations, we have attached pictorials guidelines below for installation. If wall can’t accommodate/permit for 36” bar, a 24” wide min. centered on toilet may be used. Since 1970, we’ve been helping our customers ensure that their public bathrooms are accessible to all people. With more than 40 years of experience, we have the knowledge and experience to help supply your public bathroom with the right parts and accessories. ADA Grab bars are essential for ensuring handicap accessibility for your bathroom. Our wide range of grab bars come in several shapes and sizes, so you’re sure to find one that fits in your bathroom stalls. Please contact us with any questions you might have. Grab Bar L 36" X 54"
Grab Bar L 42" x 52"